The man seen by many as representing the future of Cisco has announced a Christmas shocker: He's leaving the company, apparently having spotted a brighter opportunity for himself on the other side of the revolving door. Network equipment edifice Cisco Systems seems to be melting down from the friction coming from its more and more revolving door this year. Charles H. Giancarlo, once widely seen as the top choice for Cisco's next CEO, abruptly announced that he is leaving his job as chief development officer. In Giancarlo's wake, the company said this morning it is launching a major -- if involuntary -- reorganization, away from "command and control" and toward "teamwork and collaboration." A "development council" comprised of a group of still-employed executives will now handle Giancarlo's former duties. 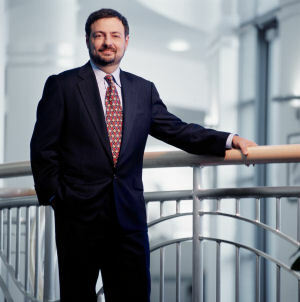 The former development manager of Cisco's routers and other technologies and also the chief of the company's multitude of acquisitions, Giancarlo will now become managing director of Silver Lake, a private equity firm in the Silicon Valley that invests in high-tech companies. Earlier this year, Mike Volpi, another candidate to replace currently chief executive John T. Chambers, resigned from Cisco to take a position with Joost, an Internet video service. Now 50 years old, Giancarlo is exactly the same age as Chambers, who indicated during a conference call this week that he isn't interested yet in stepping down from the top spot at Cisco and handing over the reigns to a successor. Chambers told journalists on the call that he would probably name a replacement for himself within the next three to five years. In a written statement about the reorg, Chambers contended, "As we build Cisco into a next-generation company, we will transition from a company that is driven from command and control to one that is built on teamwork and collaboration." Giancarlo first joined Cisco 14 years ago, with Cisco's acquisition of network switch maker Kalpana.